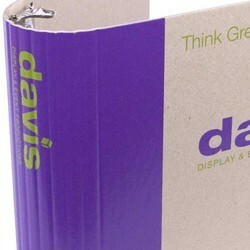 Custom paperboard binders are made of a thin and flexible board. These personalized flexible binders are popular for smaller real estate agencies, hospitals and medical groups, and many other users. They are flexible, while still being durable, and are all-over laminated for a glossy or matte look. These printed binders can be printed in an number of methods, including full color photos (also called 4 color process). Our custom ring binders are manufactured in the USA, and the minimum order requirements start at 250 binders* with quantity-discount pricing available for larger orders. Consider also adding custom index tabs to keep the look and feel consistent. Call us at (866)537-2244 (866)537-2244 or email info@buy101.com to request a quote from one of our custom product experts. 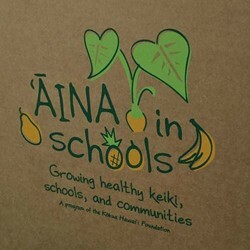 Custom printed paperboard ring binders are most popular for businesses and organizations that want to have full color images printed on the front, spine, and back covers, without paying a huge unit price per binder. They are made of a flexible paperboard that is still durable and sturdy, however, can easily be bent, which means they are not ideal for heavy handling or travelling. The colors printed are vibrant and bright, creating an impressive image, no matter your design. Just take a look at the photo gallery above to see some examples of paper board binders. You will notice that a unique feature to these style of custom binders is that the side edges are folded over on themselves, which adds strength and allows for more printing opportunities. Our ring binders are completely made is the USA, so you can rest easy knowing that you are receiving binders with high quality standards, faster shipping times, and lower shipping costs that overseas alternatives. 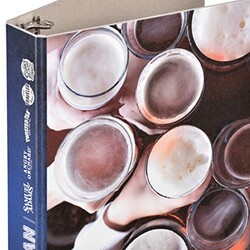 The minimum order requirement for this style of personalized binder starts at 250 pieces*, and price breaks typically come into play to 500, 1000, and more. Give our custom product experts a call at (866)537-2244 (866)537-2244 or email info@buy101.com to discuss your individual needs and request a price quote. Be sure to also ask for custom printed index tab dividers for a fully cohesive filing solution. Whether buying for a real estate company, a university, a business, or any other user, our high-quality custom printed paperboard binders are sure to impress. Take a look at the most popular printing options below. When it comes to paperboard binders, 1 color printing is not a commmon request, unless printing on a flexible chipboard style, as pictured to the left. With this simple and inexpensive printed binder option, you can customize a ring binder with your 1 color logo, contact information, and more, keeping the price low while still giving you a one-of-a-kind look. 2 Color printing offers more versatility, so you can create a more versatile look that will grab the attention of your clients. Whether you are printing a 2 color logo, or you just have a 1 color logo but want text written in a different color, this is a great option. 3 Color printing offers even more versatility, so you can print more complicated logos and artwork. 4 Color process, also known as full color, is a premium solution for those who wish to print photos, graphic designs, and more onto ring binders. This is a popular choice for large corporations and brand names that will not modify their brand image to keep costs low. With a 4CP custom binder there is no limit to the number of colors, tints, or shades that can be printed. The final touch is a laminate coating that is added to these binders to ensure longevity and create that final touch. 20pt is the standard thickness, but 24pt is also available. Q: What are the coating options? You can choose from gloss or matte standard laminate, or a soft touch laminate that you need to feel to believe. The lamination is needed to strengthen the binder so the rivets don’t pop out. 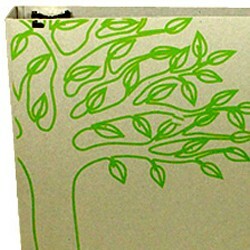 Many of our paperboard binders are eco-friendly, however, some are not. If this feature is important to you, be sure to let us know when you request a quote so we can be sure to only include the environmentally-friendly options.